What’s going on in this west Albany alley is an emergency repair job. A friend who lives behind that fence on the right told me about it, and I checked it out because it’s an example of a helpful but largely unheralded program the city of Albany runs. The problem here was that the sewer line from the house to the main had failed. The line was made in the 1950s and supposedly consisted of — this is hard to believe — essentially rolled-up tar paper. Naturally, it deteriorated over time. Ray’s Septic Service had cleaned out the pipe when it backed up some time ago, but then this week the line completely failed. The sewer lateral from the house to the main normally is the homeowner’s responsibility, and replacing it can cost thousands of dollars. But in 1999, in an effort to prevent rainwater from entering the sanitary sewer system and overloading it, the city council approved a program to help homeowners replace failed laterals at city expense. The city normally reviews each situation with contractors and awards the job to the lowest bidder. That was the plan here after the homeowners, Claus and Kim Sass, contacted Lindsey Austin of the engineering staff in Albany Public Works. But on Thursday, flooding in the garage and elsewhere became dire. Friday afternoon, I took some pictures as a crew from E.D. 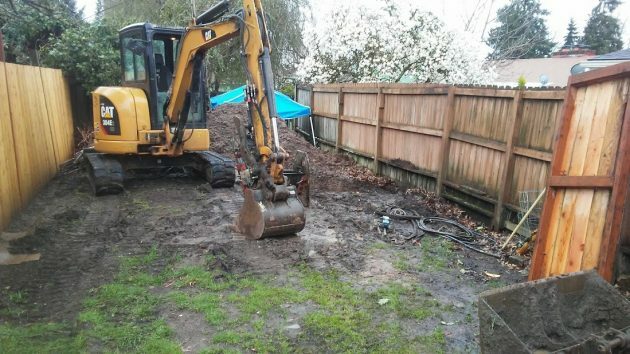 Hughes Excavating Inc., of Philomath, was doing the muddy work of installing a new lateral to the sewer main in the alley behind the house. They didn’t quite get finished and will be back on Monday. New pipe is laid out on the sidewalk, ready to be installed. Nice article Hasso! I am happy to report that my Dad’s sewer line is being replaced next week and the City of Albany is picking up the cost of replacement. As far as we can tell every house in our southeast Albany neighborhood will eventually be in the same boat! We are very thankful for this program as Dad lives in a very limited budget and even the average of $5,000 would be far too much for him to withstand. Thank you City of Albany! I was also afforded the very same benefit in 2004. Orangeburg pipe was the greatest thing ever. . . 70 years ago, post WWII. SLURP is a great program. I used it on our house too, in the Lehigh neighborhood. Three old pipe was probably what they called orange burg use to be made locally, newspaper and tar. About 3 years ago we had a sewer line fail and we’re fortunate to have this program cover the cost. We all can find problems with the City of Albany or think of a better way things should be done, but this is a program that helps the City and those residents with a problem. It’s hard to find a better program in the City. 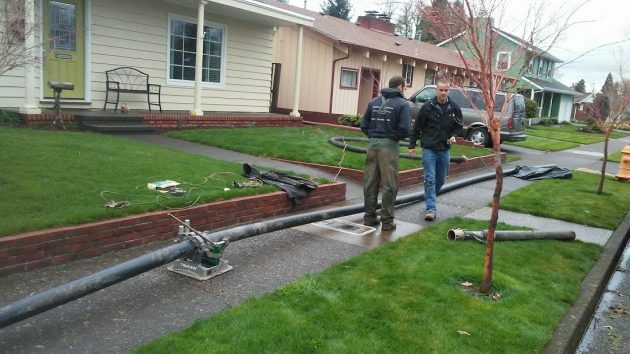 We utilized the sewer lateral replacement program several years ago. The city notified us that there was a problem, showed us photographs of the situation and how to apply for the replacement program. Our line was made out of clay pipe. The underground camera inspection of the main sewer line caught our problem before we had a crisis. Nice program!